For adventure and family fun, it’s hard to beat Moab, Utah. It was the country’s first EPA Green Power Community with five percent of its electricity coming from renewable energy. 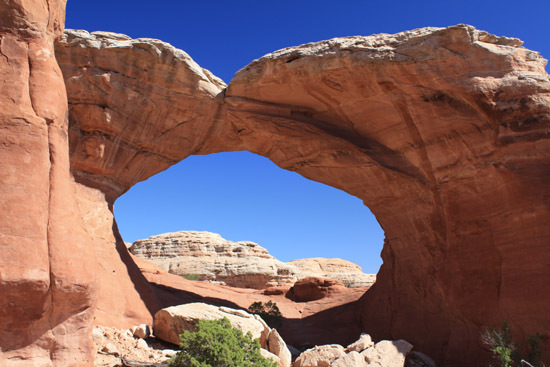 It is surrounded by some of the most spectacular scenery in the U.S., including several national parks, state parks, the Colorado River, and the beautiful La Sal Mountains. 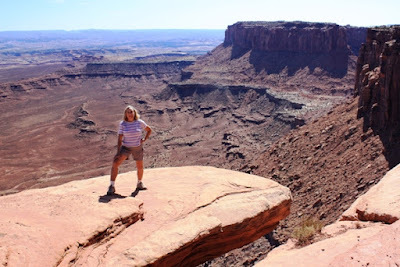 Whether you like hiking, biking, four-wheeling, fishing, or just admiring breathtaking canyons and rock formations, Moab has something you’ll enjoy. 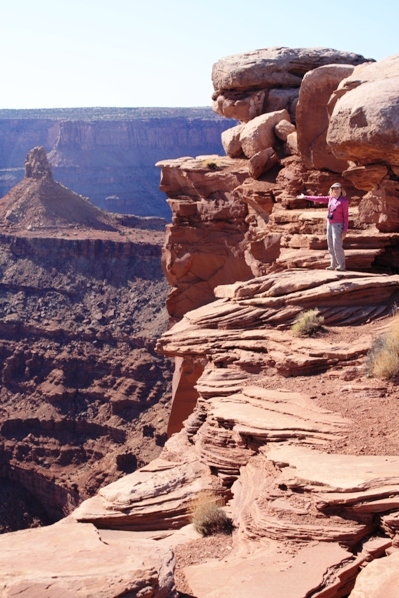 State parks offer also provide outstanding scenery in Utah. According to one legend, around the turn of the century the point was used as a corral for wild mustangs roaming the mesa top. Cowboys rounded up these horses, herded them across the narrow neck of land and onto the point. The neck, which is only 30 yards wide, was then fenced off with branches and brush. This created a natural corral surrounded by precipitous cliffs, affording no escape. Cowboys then chose the horses they wanted and let the culls or broomtails go free. One time, for some unknown reason, horses were left corralled on the waterless point where they died of thirst within view of the Colorado River, 2,000 feet below. 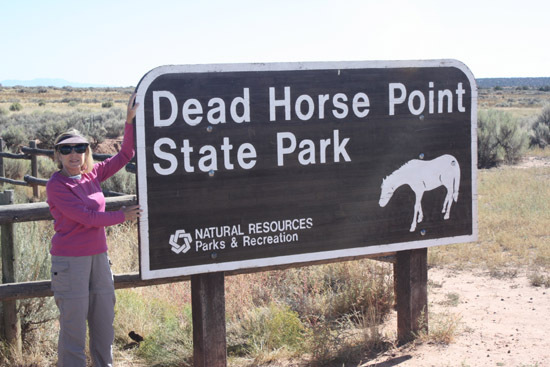 Today camping facilities and three new yurts are situated for easy access to the various mountain bike trail loops which have been built in Dead Horse Point State Park. There's such an array of amazing arches to capture your imagination. Arches National Park contains the world's largest concentration of natural sandstone arches with over 2,000 arches located within the park's 76,518 acres. Colossal sandstone fins, massive balanced rocks, soaring pinnacles and spires dwarf visitors as they explore the park's viewpoints and hiking trails. .A paved scenic drive takes visitors to many of the major viewpoints within this red rock fairyland. 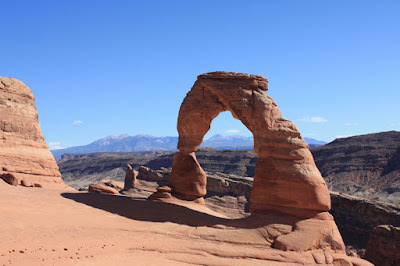 Don’t miss photo opportunities of Delicate Arch, Balanced Rock, and many other natural arches. Canyonlands is the largest national park in Utah, and its diversity staggers the imagination. It is divided into three districts by the Green and Colorado Rivers--the Island in the Sky, the Needles and the Maze. Named for their most prominent geologic characteristics, these districts are quite varied in what offer. From lofty viewpoints visitors can see nearly 100 miles in any given direction, panoramic views that encompass thousands of square miles of canyon country. Take a short day-hike or spend a relaxing late afternoon enjoying the sunset. If you’re not familiar with Canyonlands you might be pleasantly surprised by the incredible landscapes available in the park. Since 1949 the Moab area has been a popular location for Hollywood movies. Movies filmed in our area range from the old John Wayne classics to more recent hits such as Geronimo, Mission Impossible II, and Transformers: Age of Extinction. Thelma and Louise took their final leap into the Colorado River from along the Shafer Trail under Dead Horse Point near Moab. Southeastern Utah contains some of the darkest skies in the contiguous 48 United States. A moonless night spent under the stars in southeastern Utah will amaze visitors with the volume of stars visible to the naked eye. Paying attention to the moon phase and when it will rise and set can really enhance your visit. When you need time to let your mind absorb the area’s natural beauty, head to downtown Moab to shop, browse, eat and enjoy the charm and hospitality of this small resort town.